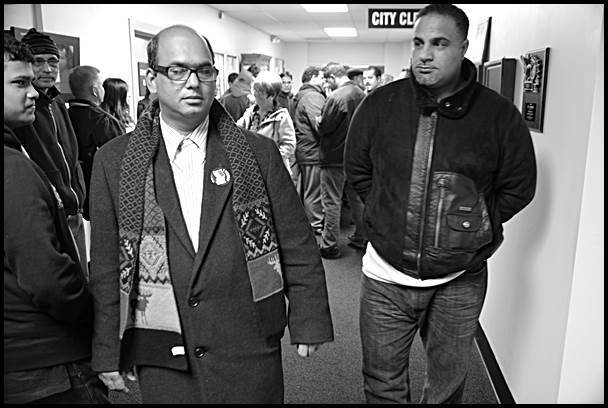 City Councilmember Mohammed Hassan (center) has started to chip away at a $3,000 fine he owes the state for campaign financial reports overdue from his unsuccessful attempt to be elected state representative in the 2012 election. City Councilmember Mohammed Hassan said it’s a “lie” that he owes a $3,000 fine for not filing campaign reports for his unsuccessful run for state representative in 2012. Although Hassan did not return past calls to comment on the matter, The Review ran into him on Tuesday, Election Day, outside of the Hamtramck High School Community Center. In a contentious interview, Hassan in turns said he refused to talk and then offered comments. He told a Review reporter that he had made a partial payment on the fines owed, but declined to be more specific. Last week The Review reported that according to Secretary of State records, Hassan has an outstanding fine of $3,000 and was facing possible criminal prosecution for failing to pay it for the past two years. On Wednesday of this week, we asked the Secretary of State to look further into the matter. We were told by a spokesman, Fred Woodhams, that the matter is now being handled by the Treasury Department, and that according to that department, Hassan made a total payment of $170 on April 17-18. It appears Hassan is on a payment plan. But Hassan is still required to submit three late campaign finance reports due from 2012. Woodhams said that unless the reports arrive within two weeks, the matter will be turned over to the Attorney General’s Office for review and possible prosecution. That still doesn’t clear up the matter of Hassan signing on April 21 an affidavit to run for state representative in the upcoming August Primary Election that he owes no fines, fees or late campaign reports. According to the affidavit, it’s an act of perjury to make a false statement. Last week’s story on the issue seemed to have incited Hassan to take matters into his own hands. He said he took issues of The Review stacked on a table in City Hall and questioned whether it was legal for the paper to be in the building. Hassan said he later returned the papers. But Hassan told Review Publisher John Ulaj outside the Community Center on election day that when he comes to power in city hall, he will banish “The Citizen” from the building. The Citizen was once Hamtramck’s weekly newspaper but went out of business five years ago. The Review started a month after The Citizen’s closing. In another matter, Hassan took issue with last week’s story on him that included the fact that the house he lives in at 2425 Neibel had fallen behind in property taxes and faced foreclosure last fall. According to the Wayne County Treasury, the owner of the house is a city contractor, Omar Nakash. Hassan said he was responsible for paying the taxes since he has a land contract with Nakash to purchase the house. Hassan said he paid the $8,000 owed. Hassan came under scrutiny last summer for falling behind on payments to the city for water and sewer service. The city turned off his service after he failed to live up to a payment plan. That lead to an inquiry into whether he could be considered a “defaulter” to the city and thus kicked out of office, which is what the city charter prescribes for elected officials who fit that definition. The charter also says that a Hamtramck elected official is a defaulter if he or she owes money to the city or another government entity, which presumably includes the Secretary of State and County Treasury. City Attorney John Clark previously ruled that Hassan was not a defaulter in owing the city money for water service. Emergency Manager Cathy Square was out of the office this week to comment on whether another review on the matter will be taken up.